Online stream anime episodes, Watch Naruto Shippuuden Episode 35 English Subbed online and free episodes. Anime Episode guide, Chapter Naruto Shippuuden Episode 35 English SubbedAn Unnecessary Addition Yamato takes leadership of Team Kakashi, while Sai, devoid of any human feelings or emotions, insults both Naruto and Sakura. While preparing to set off, Sai receives an envelope from an ANBU Root shinobi containing secret orders from Danzo. 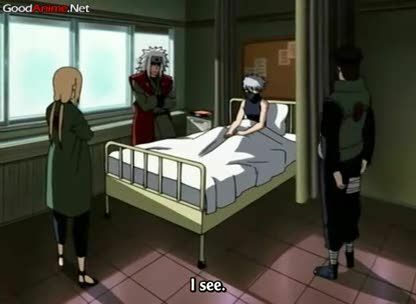 Jiraiya then meets with Tsunade and Yamato in Kakashi’s hospital room to brief Yamato on the Nine-Tailed Fox sealed within Naruto, detailing the “demon fox’s cloak”, and revealing a scar on his chest he got from Naruto, when the latter ascended to a Four-Tailed form. Finally, the new Team Kakashi sets off on their new mission to capture and intercept the spy in Orochimaru’s subordinates, and gather information about Sasuke.